Since the fourth century, when Spanish monks first started signing to communicate during their vows of silence, sign language has been used in religious communities of all faiths. Present-day American Sign Language (ASL) carries on that tradition. Like any living language, it continues to grow and change to meet the communication needs of an ever more diverse religious population. This comprehensive guide, newly revised, updated, and expanded, gives you all the vocabulary you need to communicate effectively in any religious setting. 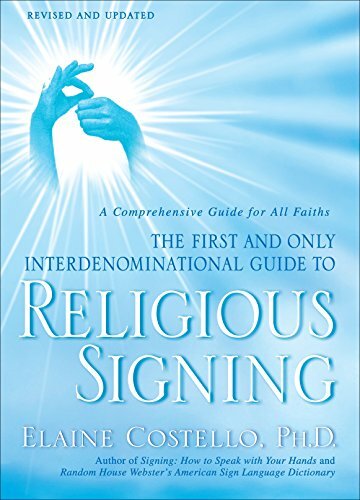 With an essential section of religious “name signs,” the addition of signs for the Muslim faith, and an expanded selection of favorite verses, prayers, and blessings, this book is an indispensable resource for signers of all denominations. Written with expertise by an educator and author associated with the field of deafness for more than thirty years, it makes communicating by ASL in a religious setting simple and easy, no matter your level of experience. If you have any questions about this product by WaterBrook Press, contact us by completing and submitting the form below. If you are looking for a specif part number, please include it with your message.